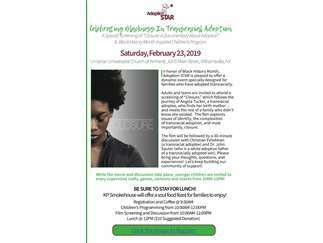 In honor of Black History Month, Adoption STAR is pleased to offer a dynamic event specially designed for families who have adopted transracially. Adults and teens are invited to attend a screening of "Closure," which follows the journey of Angela Tucker, a transracial adoptee, who finds her birth mother ... and meets the rest of a family who didn't know she existed. The film explores issues of identity, the complexities of transracial adoption, and most importantly, closure. The film will be followed by a 30-minute discussion with Christian Eshelman (a transracial adoptee) and Dr. John Sauter (who is a white adoptive father of a transracially adopted son). Please bring your thoughts, questions, and experiences! Let's keep building our community of support! While the movie and discussion take place, younger children are invited to enjoy supervised crafts, games, cartoons and snacks from 10AM-12PM! BE SURE TO STAY FOR LUNCH!